2 Bedroom Apartment To Rent in London for £9,100 per Calendar Month (Calculated). 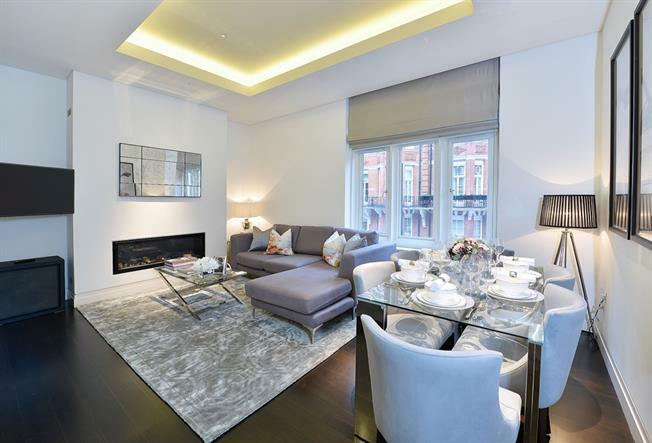 This stunning first floor apartment is set over 934 sq. ft. The living space comprises a guest cloakroom, a bright open plan/ reception room, modern fitted bathroom, two double bedrooms with the master bedroom leading onto an en-suite bathroom. The master bedroom also benefits from a panoramic bay window overlooking the North Audley Street boutiques. The apartment boasts high ceilings, large featured bay sash windows in the reception and both bedrooms with the master bedroom comprising extensive closet space. Further benefits include an internal lift service to each floor of the apartment, a storage cupboard located in the lower ground floor of the building. There is a porter on site and the apartment is extremely safe with 24-hour CCTV. With its central location and excellent public transport facilities, Mayfair allows easy access to the rest of London. Nearby underground stations include Bond Street (Central and Jubilee lines), Marble Arch (Central Line), Green Park (Jubilee, Piccadilly and Victoria lines) and several regular and varied bus services further improve accessibility.